The 8th London City Race, the world’s largest dedicated urban orienteering event, takes place in and around the City of London this September! The area includes a brand new map extension in a perfect area for urban orienteering. You will also be running around some of the City of London’s iconic landmarks. Sprint around the complex dual levels of the world-renowned Imperial College in South Kensington. Full and final details. Start times. The race will be on a newly extended map – as well as orienteering in the heart of the ancient City, it will take in Wapping and parts of the East End and, subject to permissions and course constraints, a section beside the Tower of London! Full details. Final details (PDF). Start times. This most intense of all the orienteering disciplines takes place in Waterlow Park in beautiful Highgate, near the world-famous cemetery, with stunning views back to the City of London. Competitors run 4 one-kilometre courses, including a MAZE! 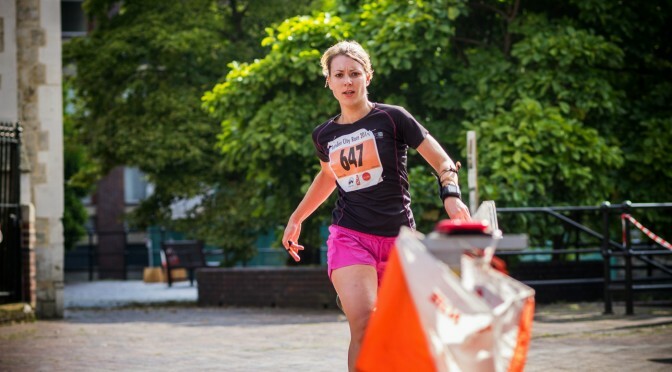 The race is organised by London Orienteering Klubb. Full details. Final details. All three races are easily accessible by London Underground. All three races will use precision electronic timing and you’ll receive a personalised results sheet at the end of each race. Advance entries are closed. There are limited entries available on the day for Friday and Saturday only, subject to spare maps and start slots remaining. There is no entry on the day at all for Sunday. Pre-ordered technical T-shirts and SI cards can be picked up from any of the three races. Full travel details will be listed with the final details, which will be published later this week. 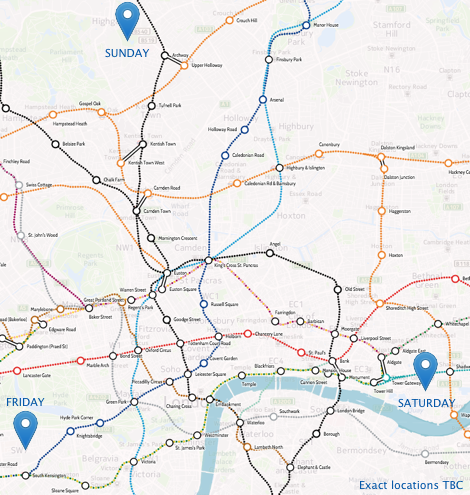 There is only limited car parking available near the events (there is some at the event centre on Saturday), so we recommend London’s tube network to travel to each event. If you have a contactless bank/credit card, just use it to tap in and out and the beginning of each tube journey, then you don’t need to worry about buying tickets or topping up Oyster cards. TfL does the maths to make sure you pay the right amount and no more. Friday’s race centre is Ethos (Imperial College Sports Centre), a 9 minute walk up “Exhibition Road” from South Kensington station (District, Circle, Piccadilly lines). There is street parking available. Saturday’s race centre is the John Orwell Sports Centre, a 7 minute walk from Wapping station (London Overground line) or Shadwell (DLR). See the walking routes in the final details document, to avoid going out of bounds. There is limited car parking available at the centre itself. Sunday’s race is in Waterlow Park, a 7 minute walk up “Highgate Hill” from Archway station (Northern line). There is street parking available. See the Transport for London tube map to get to the appropriate station. Note that routes to the races from each station will not be marked, so check the final details for walking information. Friday: Imperial College Night Sprint. Saturday: The 8th London City Race. If you have any queries, contact .